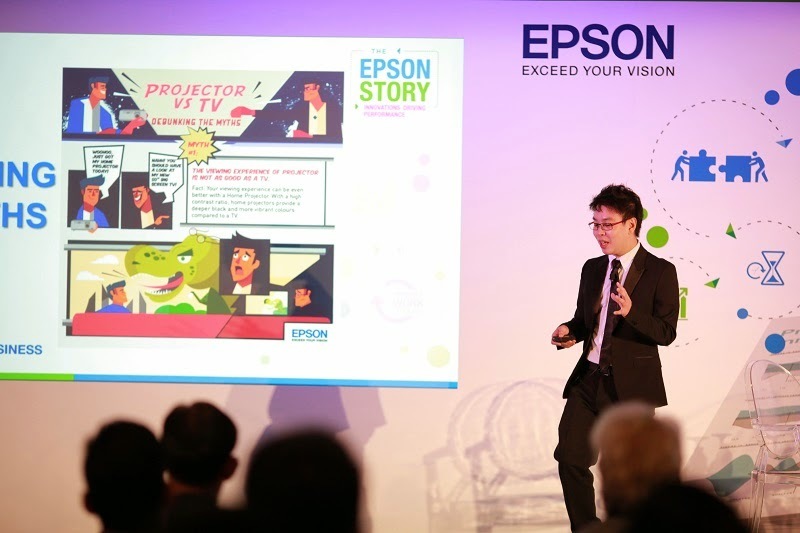 Singapore, 21 November 2014 – Epson, the world leader in digital imaging and printing solutions, showcased an integrated business suite of its products with solutions in the inaugural Epson Solution & Technology Convention today. From expert talks to demonstrations of integrated solutions, visitors gleaned insights and networked with subject experts from Epson and key industry players to tap on innovation to increase productivity, save costs, and enhance collaboration. Held at Suntec Singapore Convention & Exhibition Centre, the one-day convention is part of Epson’s on-going efforts to engage partners and customers in the corporate sector and raise awareness on the latest integrated solutions available to businesses, from Small and Medium Enterprises to Multi-national Corporations. With the focus on the impact of innovation on Singapore’s economy, executives and experts from Epson and key industry players from LifeSize, Lucep and ChemCare Asia weighed in on how businesses today can adapt to market trends by making strategic decisions with the use of technology. In addition, the Association for Small and Medium Enterprises (ASME) shared on the various government assistance schemes available to help companies raise productivity. Epson: The future of business printing and projection usage. With higher overheads, businesses want printers that do more – to deliver speed, reduce operating costs, connect to existing networks easily yet address security and environmental challenges. Replaceable Ink Pack Systems and on-demand colour label printing are set to help raise productivity and lower running costs. Speakers elaborated on the advantages of mobile Point-of-Sale systems as retail, F&B and hospitality industries increasingly tap on web servers and cloud based POS systems. As projection technology evolves, business workgroups and schools are able to utilise features such as interactive projection technology to enhance collaboration and use existing resources more efficiently. LifeSize: Creating a productive connected experience. As business teams become more geographically dispersed and complex, creating an interactive and immersive experience will help enhance collaboration and raise productivity. Lucep: To cater to fast-changing customer needs in the retail sector, businesses need to be better equipped to segment their customers, develop more personalised services, and provide a positive and seamless in-store or online experience. ChemCare Asia: With short compliance timelines and an increased awareness on health and safety issues, the demand for Globally Harmonized System (GHS) solutions is increasingly critical for the chemical industry. Epson worked with key technology partners – Lucep, LifeSize and ChemCare Asia – to bring the latest integrated business solutions to life through five “solutions” booths. Visitors experienced first-hand realistic simulations of the needs in a typical business environment, including R&D facilities, a Logistics Warehouse, a Sales & Marketing department, a Back Office and a Customer Service Centre. Product specialists were on hand to explain the benefits in terms of productivity and cost savings, as well as the processes required to customise these solutions for their businesses. – Design & Planning Department + Production: Using Epson’s EB-1430Wi ultra short-throw interactive business projectors, a video conferencing solution was developed to facilitate discussions and annotation on industrial designs. Finished designs were printed out using Epson’s high performance SureColor SC T7270 large format inkjet printers. At the production line, Epson’s LQ2190 dot matrix printers were used to print out the Bill of Material List. – Warehouse: Epson’s TM-C3510 Colour Label printers and GPC-830 business inkjet printers for on-demand colour label printing of unfinished chemicals requiring GHS compliant labels, as well as test sample labels for prototypes. Using Epson’s DS-860 colour document scanners, delivery orders returned to the warehouse can be digitally archived for audit purposes. – Sales & Marketing: Competitor research can be done with ease with Epson’s DS-70000 colour document scanner to study competitor products and packaging. Discussions and annotation with the materials can be conducted by projecting the images on the EB-1430Wi projector. – Customer Service Centre: Save manpower, time and cost with a queue system that incorporates Epson’s EB-595Wi (the world’s first 3LCD finger-touch interactive projector) for a digital signage, to display an interactive queue number request from customers, and to project the number of the next customer in line. A TM-T88V-DT thermal receipt printer helps automate the queue process. – Back Office: The printing hub of most organisations, the Back Office can be a major contributor to operating costs. Predictable print costs and hassle-free printing can be achieved with the Epson Workforce Pro WF-R8591’s super high-yield printing of up to 75,000 pages without replacing the ink and water-resistant high quality printouts, coupled with the WorkForce M400DN laser printer and MX200DNF LED Multi-function printer for small to large workgroup printing. The Replaceable Ink Pack System technology offers cost savings to meet centralised printing needs, maintain a lower inventory for consumables, and lower electricity bills with less energy used. Consolidate and streamline operations with the DS-7500 scanner to archive documents and forms, the LabelWorks LW-700 to label folders/documents and for asset tracking, the DFX9000 Dot Matrix Printer for payroll printing solutions. Partners and end users found the convention insightful and practical. “The concept of how Epson’s interactive projectors can be linked with video conferencing is something that I see value in for my clients. Today’s convention has also given me the opportunity to better understand Epson’s printing solutions. The “Back Office” set-up, which shows us the cost-saving ink technology in the printers, is certainly worth considering, even for my own office,” said Mr Jeffrey Lim, Managing Director of PAVE System Pte Ltd.
“I found the convention informative as it has given me a better overview of the products and technology by Epson. I particularly enjoyed the demonstrations as it showcased the applications of the technology that Epson has to offer. Coming from the research field, applications such as simultaneous video-conferencing and real-time annotations on the interactive projectors allow us to share ideas and information easier, especially with colleagues across different time zones,” said Mr. Chung, an end user who attended the session. “Bread and butter issues, from managing overheads, talent sourcing and management, to ensuring the best use of available resources are challenges that are not unique to businesses in Singapore. Technology players can help by taking the hype out of today’s buzzwords such as “productivity” and “innovation”, and contextualise them into practical technology-based solutions that are easily implemented and integrated into existing workflows, and more importantly, deliver results. By creating a platform for industry players to come together to share insights and co-develop integrated solutions with Epson’s extensive suite of products, we hope to raise awareness and help companies meet their business needs with ease and peace of mind,” said Ms Tan May Lin, General Manager, Epson Singapore (Sales Division). More information about Epson and its suite of corporate products are available on www.epson.com.sg.